This is the 3rd stage from Saturn V vehicle SA-514 on display at the Saturn V Center at the Kennedy Space Center near Titusville, Florida. Vehicle SA-514 was intended to be used for the Apollo 18 or Apollo 19 flight to the moon. 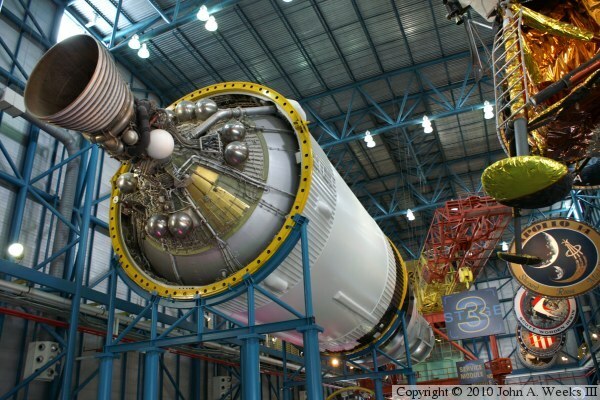 These missions were canceled after this Saturn V was completed. The first stage is on display at the Johnson Space Center in Texas, while the 2nd stage is also displayed at the Saturn V Center at KSC. This Saturn V rocket stage was put on display outdoors near the Vehicle Assembly Building, and was later restored and moved indoors when the Saturn V Center opened.